You don’t have to give up a clean and fresh-smelling home to become more eco-friendly. You can clean your home with ingredients you already have. Baking soda, water, and vinegar are the most frequently found ingredients in most eco-friendly household cleaners. Give some of these a try. If you like shiny windows, mirrors and glass surfaces, then you probably need to make an eco-friendly window cleaner. It’s super easy; you simply need a glass spray bottle and equal parts glass vinegar, water, and isopropyl alcohol. Use a reusable lint free soft cloth to clean surfaces. You can also use old newspaper to bring a shine to your glass and mirrored surfaces. If you have laminate floors, use the same recipe for windows, but add a few drops of dish soap to help it work better. You can also add some olive oil to help condition the floors if they are made from wood. If you dry after washing, the shine will show even more. You can make a very useful and earth-friendly furniture polish with two simple ingredients. Mix 1 part cold pressed olive oil with 1/2 part lemon juice. Use very sparingly to polish clean furniture to a beautiful sheen. You can clean the furniture first with 1 cup distilled water mixed with 3 TBS distilled white vinegar. The trick is to use a soft cloth, and to dry thoroughly when finished. If you have metal or stainless pans, you can quickly whip up an eco-friendly cleaner each time you want to clean up the pans. Do not make this in advance. A good tip is to have some baking soda in an old Parmesan cheese shaker at the ready near the sink. Shake on your pans as you wash them. You can add a little hydrogen peroxide to kick it up a notch. Baking soda is good for a lot of things, including cleaning silver. Make a paste of baking soda and water, in about equal amounts. Apply to the silver with a soft microfiber cloth (or extra soft baby toothbrush for silver with intricate designs), making small, circular motions. Once covered, rinse and dry silver. You know that horrible scum that gets in your bathtub and bathroom sink? You can get rid of it naturally and safely. In a glass beaker, mix 1 cup of distilled white vinegar with 1 TBS cornstarch. Heat until it’s hot and comes to a boil; mix quickly, being careful not to splash it. It’ll look kind of like a gel-like substance. Using a funnel, pour into a glass spray bottle, then add 2 TBS dish soap and shake well. Spray on the area, let sit for a few minutes, then wipe clean with a soft cloth. Rinse and dry. It’s easy to get rid of lime deposits by just using plain, distilled white vinegar. Spray on the deposits and let sit, then use a soft cloth to wipe down until dry. No need to rinse. To get the lime deposits off faucets, just use an old plastic grocery bag and fill with vinegar and tie to the faucet. Leave overnight if desired. To clean stainless you have several choices. You can use distilled white vinegar on a soft cloth. This is the best choice for large appliances like refrigerators or the stove. For your stainless sinks you can use a paste of baking soda and water, but be sure to rinse very well and dry to ensure that you’ve removed all the cleaner. These ideas are easy to use and you likely already have most of the ingredients on hand. 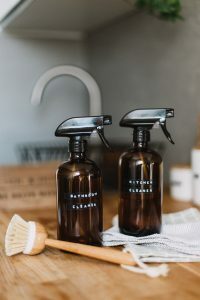 Buying these ingredients in large quantities will save a lot of money and be a lot better on the environment than prepackaged chemically-laden cleaners.